A low conversion rate can harm your business by slowing your leads and sales to a trickly. Fortunately, there are plenty of ways to fix the problem. First, though, you need to know why you have a low conversion rate. What’s causing people to bounce from your site or read your content without any other engagement? Data and tools can help you identify the culprit, but it helps to know what red flags to consider. I’m going to take you through 13 potential reasons for your low conversion rate, then answer four common questions involving conversion rate metrics. The reasons behind a low conversion rate can vary widely, but if you pay careful attention to the data you collect from your website, you can trace the problem back to its source. In most cases, there’s a blatant disconnect between what you’re offering and what your audience wants. The disconnection might boil down to poor communication, ineffective use of popups, or something else entirely. Let’s look at the top 13 reasons your site might suffer from a low conversion rate and what you can do about it. Communication is essential in any marketing campaign, whether you’re talking to people in a brick-and-mortar store or communicating via offers on your website. If your audience doesn’t understand what you’re offering, they’ll click away rather than try to suss out your offer. Clarity is key when it comes to communicating with your audience. Simple sentences, strong verbs, and unique adjectives can help convey value. Let’s say you run a web hosting service. You have three plans, and you compare them side-by-side on your landing page. Listing the features of each plan might sound useful, but if you don’t guide your customers toward the best plan for their needs, they’ll just feel confused. A newbie to website development probably won’t buy anything because he doesn’t know which plan is best suited for his purposes. When you write a call to action, think about the offer from your customers’ points of view. What will entice them to click? Maybe you have a top bar on your website that advertises a specific offer. 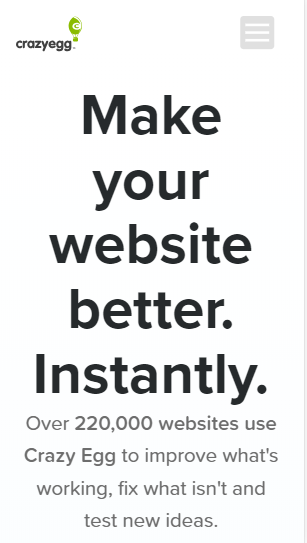 If the headline and CTA don’t match perfectly, though, your visitors probably won’t click. The headline doesn’t match the CTA. The former advertises a free checklist, while the CTA tells users to subscribe. The two have nothing to do with each other. How do you remedy the problem? Let the CTA mirror the headline. Now, the CTA references the lead magnet mentioned in the headline. On the subsequent page, you can let users tick a box that says they want to join your email list. It’s impossible to know what copy will resonate with your audience until you test different versions, but don’t start with lackluster prose. Your copy should convey excitement, urgency, or trust. 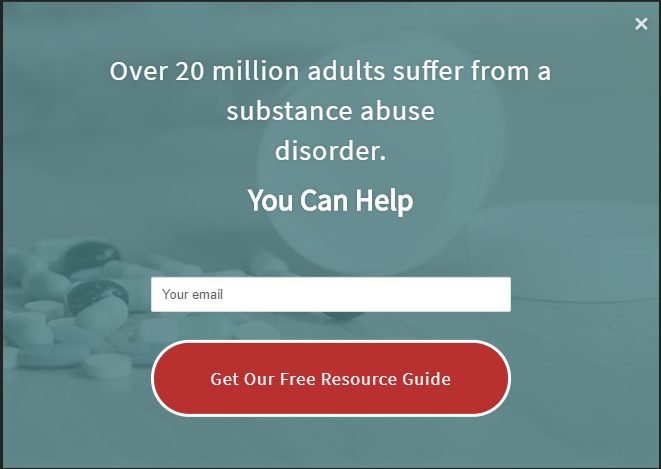 If you run a nonprofit organization that helps people overcome addiction, you could use empathetic copy to get your audience to sign up for your email list. Tap into the emotions you want your prospects to feel when they read your copy. User experience is one of the most important things to consider when evaluating your conversion rate. If visitors can’t find what they want or need easily, they’ll go somewhere else. For instance, if your visitors encounter a popup the second they arrive on your site, they might simply click away in annoyance. It doesn’t matter how attractive you make the offer — the visitor isn’t ready for what you’re presenting. Maybe you have an e-commerce site. A visitor stumbles across one of your pages via Google search. He or she doesn’t know anything about your brand or what you sell. If you immediately serve a popup or a push notification, the user won’t understand. A landing page should serve one purpose: Convert the user on your offer. That’s it. If your landing page has too many distracting elements, your visitor won’t know where to look. Popups, navigation links, more than one CTA, and confusing visuals can all distract your user from what you want him or her to do. The solution? Pare down. Remove any elements that don’t contribute to conversions. Keep testimonials, explainer videos, simple photographs or illustrations, and your headline and CTA. Ditch things like navigation bars, footers, sidebars, and unnecessary information. Exit popups often don’t work. However, that doesn’t mean there’s a flaw with page takeovers. Marketers just don’t use them the right way. Think of an exit popup as a landing page. It has one purpose: to convert the user. Design your headline, image, body copy, and CTA with the end user in mind. A great exit popup incorporates attractive visuals as well as a slam-dunk offer, unique copy, and a compelling CTA. I created this example in about 30 seconds via Hello Bar. Notice that I’ve selected an image that lends credibility to my brand. I’ve told my audience what they’ll get for signing up for my email list and used a CTA that reflects my headline. Sometimes, you need to ask for several pieces of information. 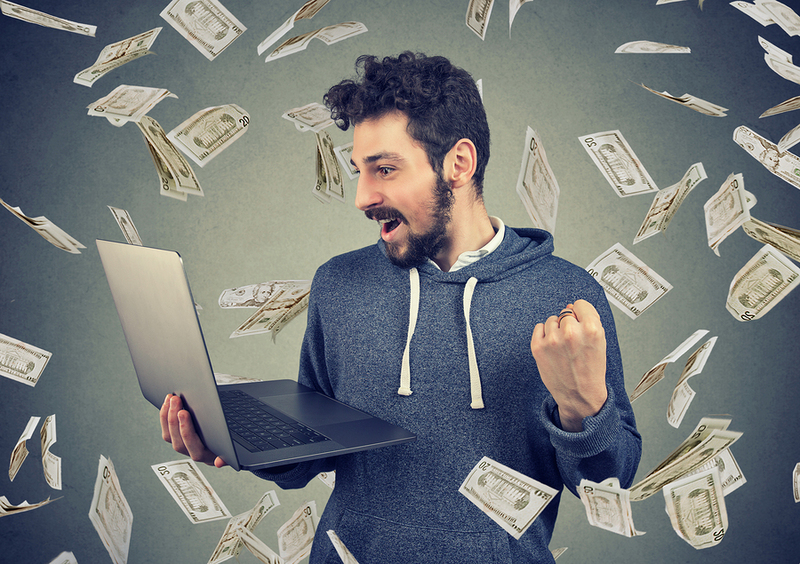 For instance, if you want to qualify your leads when collecting email addresses, you might ask questions about the subscriber’s budget for a product or service. However, you never want to ask for too much information. If it’s not necessary, remove the field. I use an exit popup on my personal website. It only asks for two form fields. People lead busy lives, so they don’t have time to fill out long, complicated forms. If you can get away with just asking for an email address, do so. In addition to shortening your forms, make sure you’re clear about each field. For instance, mark any required fields so users don’t get confused. If you’re asking for something like a phone number or date, tell the prospect what format you want it in. When a prospective customer searches Google, you want to appear first in the search engine results pages (SERPs). Running ads can get you plenty of clicks, but you also want to appear organically for relevant search terms. Otherwise, your audience can’t find you. In some cases, low conversion rates have nothing to do with your offers or your website’s user experience. Instead, you simply have low traffic. Creating content and optimizing it for search can rectify the problem. The more traffic you get, the more opportunities you have to convert prospective customers. Your website should be just as user-friendly on mobile devices as it is on laptops and desktops. Access your website from a mobile device and approach it like a new visitor. Do you hit any speed bumps? As you can see from the screenshot above, Crazy Egg looks different on mobile than it does on desktop. However, it’s optimized for mobile. You get the logo, hamburger menu, headline, and social proof. It’s also easy to navigate. Check your website for mobile stumbling blocks like too-small fonts, poor image rendering, too-small navigation buttons, and other problems. Videos and images can increase engagement levels by a considerable margin. 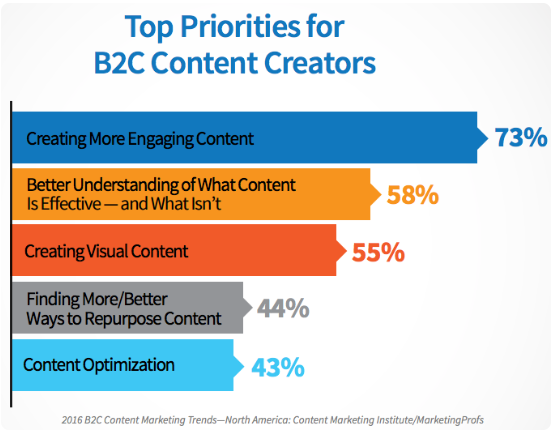 In fact, more than half of respondents to a digital marketing survey in 2016 cited creating visual content as a top priority. For better conversions, incorporate both images and videos. Your prospects can engage more fully with those assets than with a simple description, and visual content helps replicate the experience of seeing a product on a store shelf. 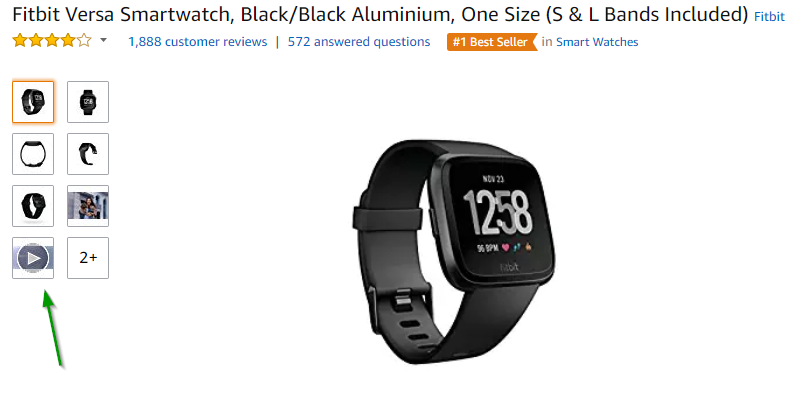 If you visit Amazon’s page for the Fitbit Versa smartwatch, you’ll notice that it includes several visuals. In addition to numerous images, there’s also a product video. Consider replicating that strategy on your own website to encourage immediate purchases. 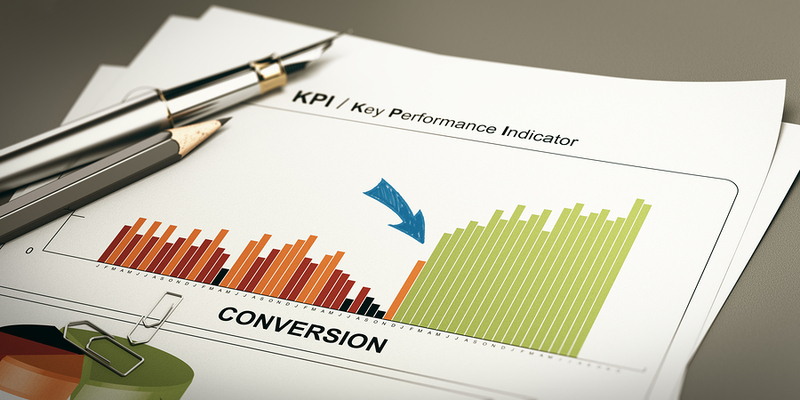 Proper conversion tracking is essential if you want to have correct metrics. Maybe you haven’t used the correct UTM parameters on your site, for instance, to track conversions correctly. If you’re not sure whether you have tracking set up correctly, go back to Google Analytics. Start the process over and fill out the necessary form fields for each conversion you wish to track. The last thing you want to do is make decisions about your website and marketing campaign based on inaccurate data. If a prospective customer has a question, you want him or her to be able to get in touch. If you don’t supply contact information or offer live chat on your site, the prospect might go elsewhere rather than dig around for an email address. Include your contact information prominently on every page of your site. If you have live chat, make sure it’s obvious and user friendly. Trust can be tenuous, especially in online marketing. If a consumer finds a reason not to trust you, he or she won’t part with contact information — and certainly not payment information. Add as many trust signals to your website as possible. Make sure your copy is professional and free of errors and that prospects can get in touch if they want to speak to a real person. If you’re like many business owners, you have some questions about conversion rates. Following are some of the questions I get most often. 1. How do I know if I have a low conversion rate or a decline in conversions? Tracking your conversion rates and monitoring the numbers regularly is the best way to stay on top of this data. If the conversion rate goes down or if it fails to lift, you might have a problem like one listed above. There are tons of statistics related to conversion rates, so you can’t always rely on generalized or even industry-specific averages. It’s more important to get a baseline for your own conversion rate, and then do everything in your power to increase that rate. Keep in mind that there’s no such thing as too many conversions. You can always improve by testing out new offers and A/B testing your page design and copy. 2. How do you calculate a conversion rate? You can calculate conversion rate in several ways depending on the type of conversion you’re tracking. For instance, if you want to know your conversion rate on a lead magnet for email opt-ins, you can divide the number of people who opt in by the number of people who visited the page or saw the offer. That’s pretty easy. UTM tracking codes can help you track specific pages and offers. If you want to track conversions on sales based on an ad or other offer, take into account the referral source. For instance, you can use UTM parameters to track the number of people who visit a sales page on your website by clicking on a Facebook Ad. You would the number of people who converted by the number of people who clicked on the Facebook Ad. Let’s say that you want to know your conversion rate on an email opt-in offer on your homepage. If 10,000 people visited your homepage in a 30-day period and 4,000 of them provided their email addresses to opt in, you would divide 4,000 by 10,000. You get .4. Multiply the result by 100 to get your conversion rate as a percentage. In this case, you have a 40 percent conversion rate. 3. What is considered a good conversion rate? 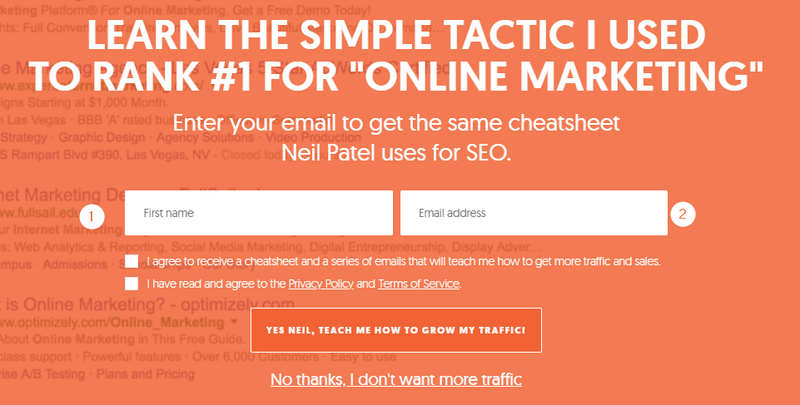 On my website, I use a cheatsheet as a lead magnet to collect emails. My average conversion rate is 7.4 percent. This means that out of every 100 people who see my lead magnet, 7.4 of them will opt in. That’s a pretty good conversion rate. Many of the brands I work with do well with a 5 percent conversion rate. 4. And what is a good conversion rate for e-commerce? According to data collected by SmartInsights, the average conversion rate for e-commerce stores in the United States ranged from .19 percent to 3.73 percent in the final quarter of 2017. If your conversion rate exceeds 4 percent, you’re doing extremely well in comparison to other e-commerce stores. Keep in mind, though, that you might still need to optimize your conversion funnel. The more you focus on refining the funnel and nurturing your leads, the more your conversion rate will increase. A low conversion rate doesn’t spell death for your business. It just means that you have some work to do. 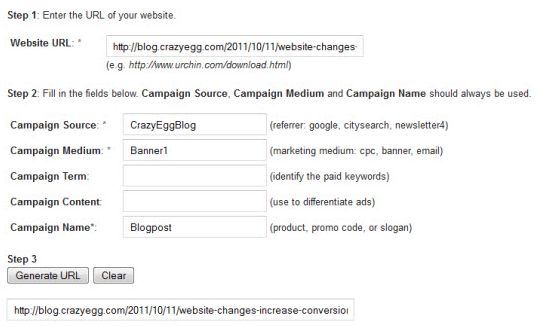 Crazy Egg can help you boost conversion rates by providing you with solid data about your website visitors. User experience reports, such as heatmaps and scroll maps, allow you to visualize activity on your site. 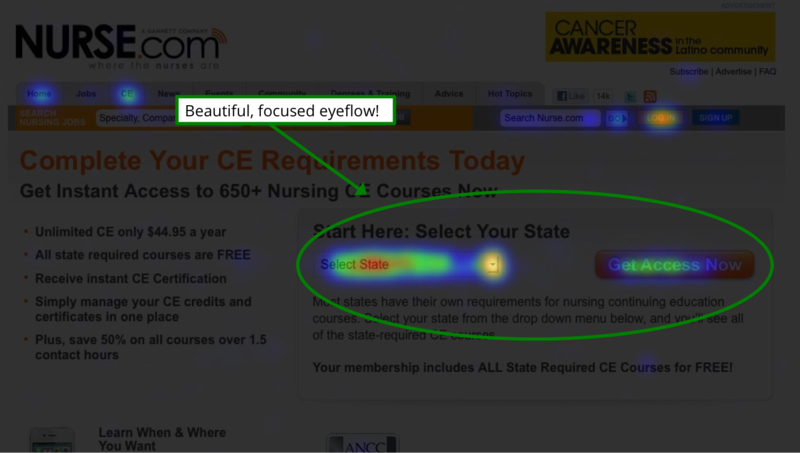 For instance, a heatmap might show you that people click more often on one particular part of your homepage. Consider adding an opt-in form in that area to boost conversions. The example above is what you want. There’s lots of focus on that CTA, which means that the CTA is doing its job. Similarly, a scrollmap could show that people stop scrolling about halfway down a blog post’s page. Adding a CTA below that point would be fruitless because there’s not much engagement there. Instead, you’ll want to put a CTA in areas where people stop scrolling. If you’re suffering from a low conversion rate, review the 14 possible reasons above and start optimizing your site. Focus on email opt-ins as well as sales to boost leads and revenue. 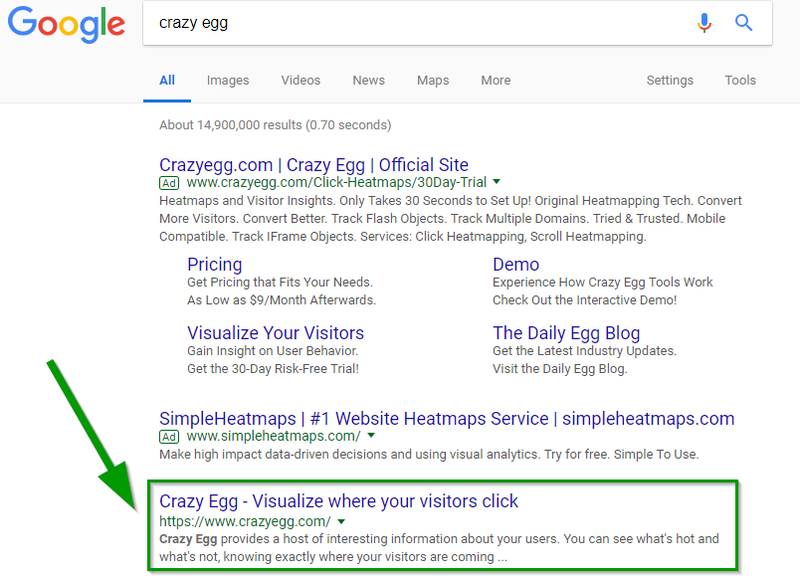 Once you have a better understanding of factors that influence conversion rates, use Crazy Egg’s tools to get to know your visitors. How do they behave when they arrive on your site? What elements do they engage with? Then conduct A/B testing to see which offers entice your visitors more. The more data you collect, the more informed your decisions become. Knowing this information will allow you to capitalize on the most valuable digital real estate.